The Ukrainian Catholic Bishops of Canada and USA held their annual meeting from May 2nd thru May 4th, 2017 in the Library Building of the Ukrainian Catholic Basilian Fathers at St. Josaphat Monastery located in Glen Cove, NY. A very comfortable and prayerful environment was generously provided through the hospitality of Very Rev. Basilio Salkovski, OSBM, Provincial Superior of the Basilian Fathers of St. Josaphat, OSBM. Participants in the meeting were Most Rev. Stefan Soroka, Metropolitan for USA and Archbishop of Philadelphia, Most Rev. Lawrence Huculak, OSBM, Metropolitan for Canada and Archbishop of Winnipeg, Most Rev. Paul Chomnycky, OSBM, Bishop of the Eparchy of Stamford, Bishop David Motiuk, Bishop of the Eparchy of Edmonton, Most Rev. Ken Nowakowski, Bishop of the Eparchy of New Westminster, Most Rev. Bryan Bayda, CSsR., Bishop of the Eparchy of Saskatoon, Most Rev. Bohdan Danylo, Bishop of the Eparchy of St. Josaphat in Parma, Bishop John Bura, Auxiliary Bishop for the Philadelphia Archeparchy and Bishop Emeritus Basil Losten of the Eparchy of Stamford. The Canadian hierarchs shared their experience of their ‘ad limina’ visit made with the Catholic Bishops of Western Canada to the Holy Father. Topics to be considered at the upcoming Synod of the Ukrainian Catholic Church were discussed, as were the consideration of themes for an upcoming Sobor of our Church to be held in 2020. The ongoing implementation of the Vibrant Parish initiative in our eparchies was discussed, as were the preparations for the upcoming visit by the Patriarchal Catechetical Commission to Canada and USA. The provisions of the Particular Law of our Church were reviewed as were proposed statutes for the Winnipeg and Philadelphia Metropolias. The Bishops discussed the use of social media and explored ways to combine our efforts in various social media initiatives in eparchies. A committee was formed to develop a core marriage preparation program for implementation in all of our eparchies via social media. A North American Liturgical Commission was formed to advise the Bishops in the ongoing developments in Liturgy. Clergy formation and the state of consecrated life in our eparchies were also reviewed among other topics of common concern. 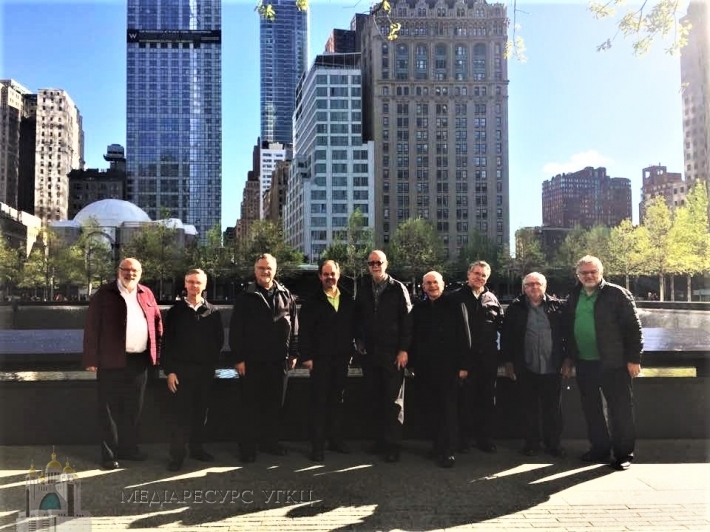 A half day visit to the recently opened National September 11 Memorial & Museum in New York City and to St. George Ukrainian Catholic Church were included during the meeting days. The annual meeting of the Ukrainian Catholic Bishops of USA and Canada facilitates close fraternal sharing and the development of initiatives of common concern. There is much wisdom in journeying together as the Bishops endeavor to meet the ever changing needs in pastoral ministry in our Ukrainian Catholic Church.